Creator of French burlesque opera; born at Cologne June 21, 1819; died at Paris Oct. 5, 1880. 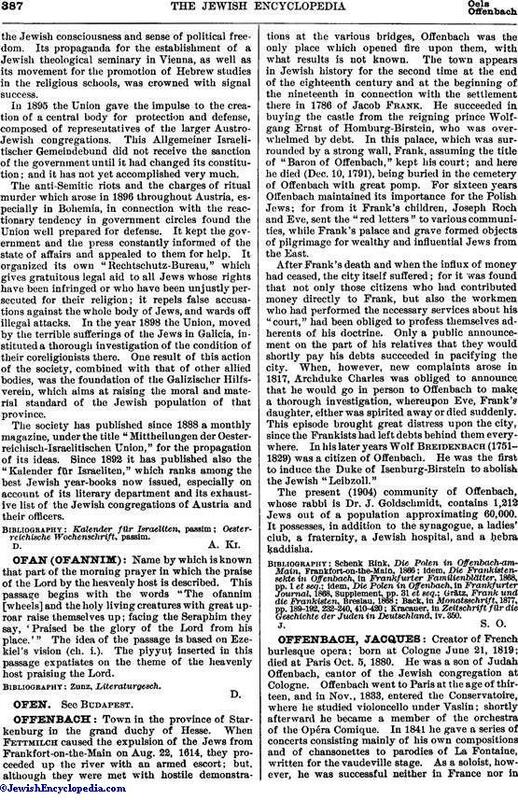 He was a son of Judah Offenbach, cantor of the Jewish congregation at Cologne. Offenbach went to Paris at the age of thirteen, and in Nov., 1833, entered the Conservatoire, where he studied violoncello under Vaslin; shortly afterward he became a member of the orchestra of the Opéra Comique. In 1841 he gave a series of concerts consisting mainly of his own compositions and of chansonettes to parodies of La Fontaine, written for the vaudeville stage. As a soloist, however, he was successful neither in France nor in'Germany, whither he went in 1848; so that after two years of touring he decided to return to Paris, where he succeeded in obtaining the position of leader at the Théâtre Français. Offenbach now began to devote himself to operatic composition, and achieved his first success with his "Chanson de Fortunio" (in Alfred de Musset's "Le Chandelier") in 1848. 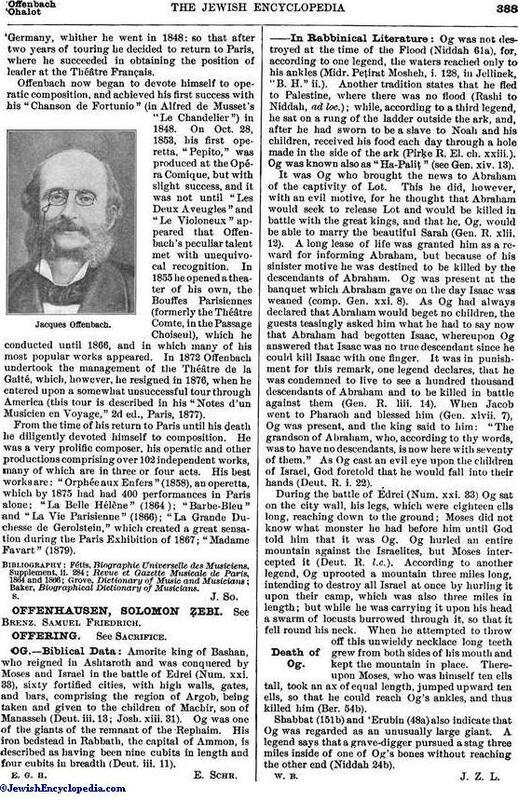 On Oct. 28, 1853, his first operetta, "Pepito," was produced at the Opéra Comique, but with slight success, and it was not until "Les Deux Aveugles" and "Le Violoneux" appeared that Offenbach's peculiar talent met with unequivocal recognition. In 1855 he opened a theater of his own, the Bouffes Parisiennes (formerly the Théâtre Comte, in the Passage Choiseul), which he conducted until 1866, and in which many of his most popular works appeared. In 1872 Offenbach undertook the management of the Théâtre de la Gaîté, which, however, he resigned in 1876, when he entered upon a somewhat unsuccessful tour through America (this tour is described in his "Notes d'un Musicien en Voyage," 2d ed., Paris, 1877). From the time of his return to Paris until his death he diligently devoted himself to composition. He was a very prolific composer, his operatic and other productions comprising over 102 independent works, many of which are in three or four acts. His best works are: "Orphée aux Enfers" (1858), an operetta, which by 1875 had had 400 performances in Paris alone; "La Belle Hélène" (1864); "Barbe-Bleu" and "La Vie Parisienne" (1866); "La Grande Duchesse de Gerolstein," which created a great sensation during the Paris Exhibition of 1867; "Madame Favart" (1879).